One of the greatest public health challenges of the 21st century is antibiotic resistance, which occurs when a few bacteria in a given population develop a genetic mutation that enables them to survive — even in the presence of antibiotics.How do bacteria become drug resistant? Suppose a particular antibiotic inhibits an enzyme required for bacterial replication. If one bacterium mutates so the enzyme has a slightly different shape, the antibiotic is no longer effective. The mutated bacterium lives on and continues to replicate, even as all the others die off. Over time, this resistant strain becomes dominant, spreading from person to person, remaining unchecked and thriving. It is not uncommon for a strain of bacteria to become resistant to several different antibiotics, giving rise to the term multi-drug resistant bacteria.In this issue of the WEEKLY, we’ll take a look at a novel approach to fighting bacterial infections — bacteriophage. 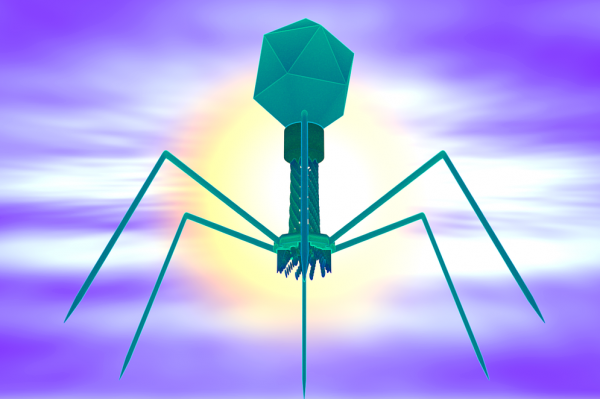 A bacteriophage — also referred to as a phage — is a virus that infects bacteria. By attaching to a bacterium’s surface, a phage punches holes in the membrane and injects its own genetic material inside. The phage then replicates inside of the bacterium, creating so many new viruses that the bacterium breaks open, releasing newly produced viruses, which can then go on to infect other bacteria, continuing the cycle. The word “bacteriophage” is derived from the Greek word phagein — “to devour.” So we can think of bacteriophage as, literally, devouring bacteria — a potentially very useful trait! Typically each phage is specific for a type of bacteria, meaning that if adapted for therapeutic use, researchers can select viruses that will only attack harmful bacteria, and leave the many strains of “friendly” bacteria that make up our gut microbiome alone. And since each type of phage has coevolved for millennia with its chosen strain of bacteria, each adapting and changing in response to the other, resistance is much less likely to evolve as has been the case for antibiotics. Likewise, humans have safely coexisted with bacteriophage for a long time, suggesting that there should be few safety issues with their use as therapeutics. Scientists have known about the bacteria-devouring ability of phage for about 100 years, but with the advent of antibiotics in the late 1920s, medicine’s focus shifted to these new wonder drugs because they were easier to manufacture and test in controlled settings. Now that antibiotic resistance is emerging, so, too, is a renewed interest in bacteriophage, which are now starting to be manufactured and tested in a standardized way for the first time. Let’s take a look at some of the biotech companies delving into the world of bacteriophage-based therapeutics. The first multicenter clinical trial examining the use of bacteriophage as antibacterial treatments was initiated in 2015 by French biotech Pherecydes (Paris, France). Preparative work for the trial began in 2013 as researchers established protocols for producing phage that met good manufacturing practice guidelines. The researchers are studying two different “cocktails” of bacteriophage — mixtures of different bacteriophage that have shown activity against different substrains of a particular bacteria in the lab. The first contains 13 different phages targeting P. aeruginosa; the second, 12 phages that target E. coli. Both are being evaluated for the treatment of burn wound-associated infections. The company is also preparing to begin clinical trials of phage therapy for the treatment of diabetic foot ulcers infected by S. aureus. AmpliPhi Biosciences (Richmond, VA): Phage cocktail AB-SA01 has completed Phase I clinical testing for antibiotic resistant S. aureus in two different clinical settings: Chronic rhinosinusitis as well as acute and chronic wound and skin infections. Additional target indications include bacteremia, endocarditis, prosthetic joint infections, osteomyelitis, and diabetic foot ulcers. TechnoPhage (Lisbon, Portugal): Phage cocktail TP-102 is in Phase I studies targeting bacteria associated with chronic ulcers. Intralytix (Baltimore, MD): Completed Phase I studies using a bacteriophage for the treatment of infected wounds. Recently announced that they have received FDA clearance to begin Phase I/IIa testing of phage therapy for inflammatory bowel disease. EpiBiome (South San Francisco, CA): Phage cocktails targeting E. coli and S. dysenteriae diarrheal infections in preclinical development. Creating a phage cocktail can be a challenging biomanufacturing problem. An alternative approach to combining beneficial characteristics of different viruses is to genetically engineer a synthetic virus that combines the properties of multiple phages into a single genome. For example, scientists could insert genes into a phage genome to increase the range of bacteria subtypes an individual phage can attack, yet still maintain the specificity that prevents the phage from raiding friendly bacteria. Researchers could also add in genes to make the bacteriophage’s antibacterial response even stronger. Companies with engineered bacteriophage in preclinical development include Synthetic Genomics (San Diego, CA), C3J Therapeutics (Los Angeles, CA), and EnBiotix (Cambridge, MA). A third approach to tapping into the therapeutic power of bacteriophage lies in isolating the component or components that make them toxic to bacteria. For example, in order to inject their genome into bacteria, phage must essentially punch a hole in the membrane, which is itself very damaging to the bacteria. The viral protein that creates these tears in the membrane are called “lysins” — enzymes that essentially chew holes in the bacterial cell wall. ContraFect (Yonkers, NY) is conducting Phase II clinical studies of its drug CF-301 — a lysin — for the treatment of S. aureus bloodstream infections. Although still in the early days of clinical testing, bacteriophage offer the possibility of being a safe and effective solution to the current antibiotic resistance public health crisis.